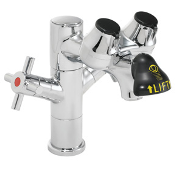 Speakman SEF-1850 combines a lab faucet and eye wash in a single post mount design to save space. To activate, simply pull a lever and water will instantly flush into the eyes of the user. The two separate water supplies of this system ensures that the water will be cold even if hot water is being run from the sink. This eye wash and lab faucet is ANSI Z.358.1 compliant.